You are currently browsing the tag archive for the ‘Front Range Open Studios’ tag. September signals fall. Accompanying that is the Front Range Open Studios tour of which I have been one of the participating artists since its inception just 6 short years ago. The tour has grown, just as the artists have. My work has changed dramatically since I first joined the tour thanks to the encouragement I have received from others and my personal commitment to being a better artist. I have created new works especially for this coming weekend. This weekend, people who live in the Tri-Lakes area of Colorado, have a wonderful opportunity to visit working artists studios like mine. All of the artists on this tour enjoy discussing their creative process. Here is the map to all of our studios. One of the unique things about this tour is our desire to educate the public about how we create our art. Sure we have work available for purchase if it calls to you. However, our focus is showing people our process, our love of the craft and our inspirations. In my case, I have a fairly extensive arsenal of tools. 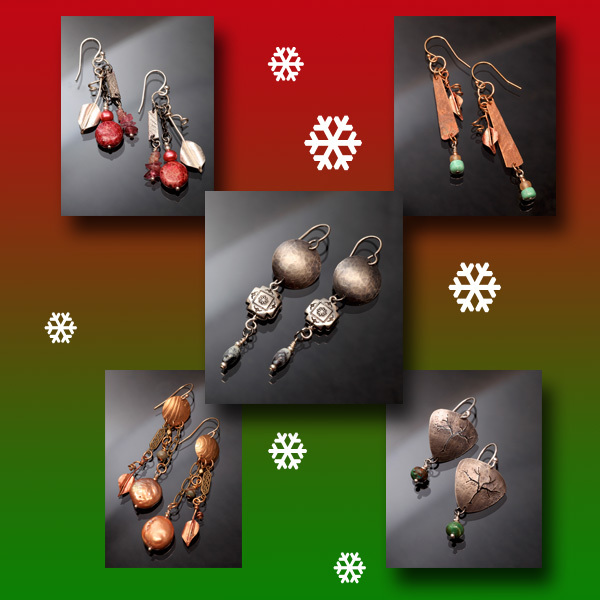 They help me fabricate my art jewelry. The photo below shows just a sample of the tools I use in my work. This year, people who visit my studio will see the process that transforms a flat piece of metal into a tiny Treescape earring. Those steps, a minimum of 22 for each work, demonstrate how committed I am as an artist to bring my interpretation of beauty into the world. I once had a gentlemen tell me that I “had too much time on my hands” because of what I did to make these. Sadly, he missed the point. As an artist, I am driven (just like my colleagues) to do what it takes to make art. It is our passion. As essential to our life as eating, breathing and sleeping. If you live in the area, I invite and encourage you to visit our studios this weekend, 9/10-11 from 10:00 AM to 5:00 PM each day. I believe you will find the only real thing that differentiates us from each other is our respective mediums. I work in metal. I am a Chasing & Repoussé artist. I create art. We hope to inspire young and old alike. Embrace your inner artist and join us. For the past 5 years, I have been one of the artists of the Front Range Open Studios. Doors have been opened, new friendships have occurred and I have had the pleasure of working with the most enthusiastic, energetic founder of the studio tours, Nancy Bonig, who inspires me and is a great friend. Each year, Nancy opens her home for us and hosts a Customer Appreciation Party for all of you who have supported us by becoming fans and purchasing our work. It is a private, invitation only event. Yet I wanted to share this here for those who are not part of my mailing list (you can sign up here) and may live in the Tri-Lakes area of Colorado. We want to thank you and invite you to this event too. As you can see, I will be joined by 5 other artists from the tour. We will have some unique works, some at special pricing, as our way of thanking you. Please come and enjoy the festive atmosphere and holiday treats. We love talking about our process, our latest works and art in general. May your Holiday Season be bright, filled with love and laughter. 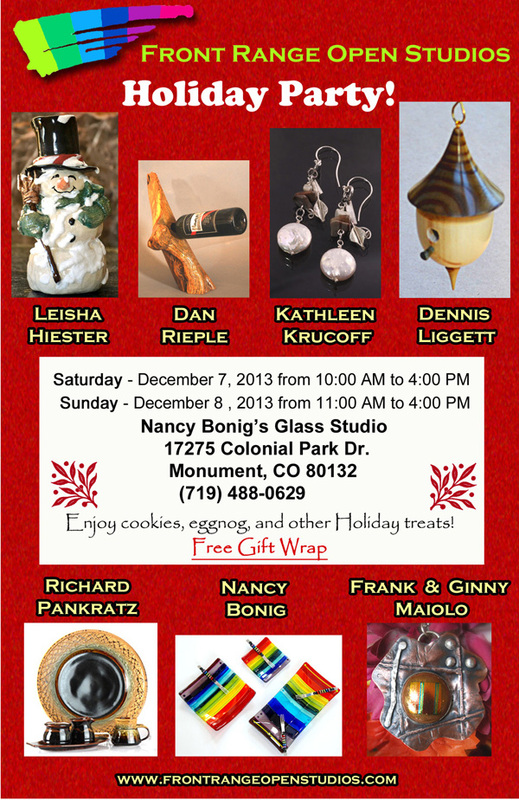 Please accept this invitation to come and celebrate the Holidays with nine of this year’s Front Range Open Studios artists this coming weekend at Nancy Bonig’s Glass Studio. We want to show our appreciation to you for your support of the arts. There will be holiday treats, eggnog, spiced cider and more. 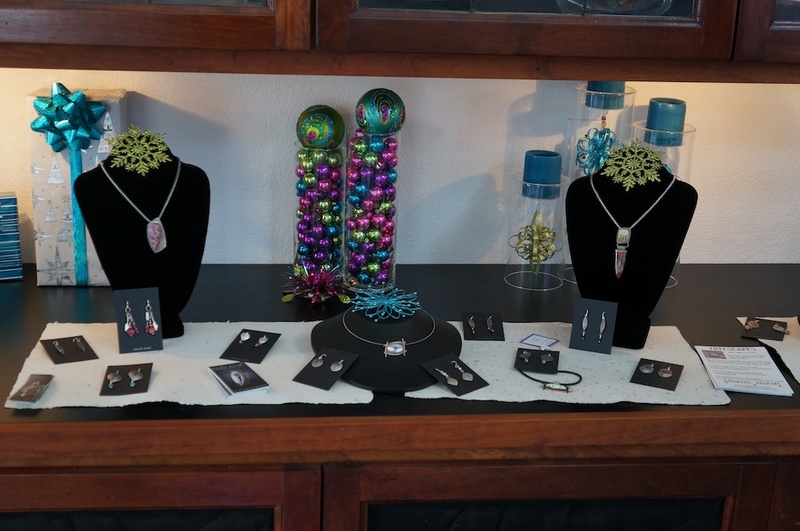 All of us will be offering our works at special pricing if you would like to do some shopping while you enjoy the festivities. Here’s a preview of my display. This weekend is going to be a chilly one, so why not escape into the world of nine artists? I can promise you it will be enchanting. Wishing you the happiest of Holiday Seasons! Merry Christmas! Happy New Year! Until next time, aspiring to be more as an artist and a person. If you live close to Monument and the surrounding areas, this is the weekend for the Front Range Open Studios. It is our inaugural year and Nancy Bonig has worked so very hard for all of the participating artists. You can find a map online showing where all of the studios are on the tour. We have such talent in this tour. I know each of us is looking forward to sharing our process with people to help develop a better understanding of what it takes to create our respective works. Here is a complete listing of all of the participating artists in this year’s tour. I wish I could visit the studios of my fellow artists as I think we have an incredible group. However, I will be busy demonstrating how I work with metal and sharing insights about my creative process. This is one of those great opportunities to learn about art, talk with the actual artists, see our works in progress and those that are completed. I hope you will join us!